Rani Glick serves up delicious and creative vegan and vegetarian meals at the market. 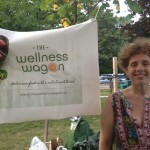 Look for many more of her inventive creations at www.thewellnesswagon.ca available for delivery! Michelle: Ok Rani, so we know that the Wellness Wagon is relatively new venture, correct? Rani: I started developing the Wellness Wagon, delivering meals officially, this past April, but I developed my site with the help of Andrew in the New Year. I had another career until recently, and became a holistic nutritionist about a year ago. I wanted to work for myself, so I thought this would be a great way to do that. I love food, and I’m interested in nutrition and health. I blog every week about different topics related to nutrition and health. Michelle: Is that content posted on your website? Rani: Yes. I write about things like the benefits of salad, or a focus on belly fat, etc. ; every week I do a different blog on different topics. I make deliveries of vegan and vegetarian meals, and my menu changes each week, so I try to tie in my menu items into my blog topics. People can buy online and I deliver to them. There are different meal plans – you can buy individual meals, for two people, or for a family of four. I create nine new dishes per week so my menus are constantly changing. Michelle: Oh wow, that must take so much creative energy each week. Rani: Well I’ve done about 120 dishes, I recycle a lot of them and add one or two here and there now. Michelle: Well it would be so much work to constantly make up so many new recipes each week. Rani: Exactly, and I’m just a one-woman show. At the market I sell meals as well as my fermented products and preserves– sauerkraut, peach chutney, pickled carrots, cabbage, and many more. Fermenting vegetables is done in a salt brine, and is beneficial for your stomach acid. We don’t really eat as many fermented foods as we used to. A lot of people have digestive issues, and fermented food really helps with digestion and building good gut bacteria, which improves your overall health. Michelle: Is there any specific places where you find inspiration for your dishes? Rani: It’s a combination of things I find online and my own creations. For example I did the chocolate chili with a cornbread topping this week, and that was all my own creation. Michelle: Yes that looks amazing! And you do this year round? Rani: Yes year round. Ill be building on my website soon as well. I’m going to start doing meal plans soon, so you could have a membership to a meal plan. I also teach about nutrition, I’m doing a continuing education course at Ryerson. Michelle: Wow you really keep busy! Rani: Ya! Well I worked for 30 years in the Arts and Culture sector. I was an arts manager, I ran non-profit organizations. I ran an arts school, a provincial organization of community arts council, and many other things, but in the end I just wanted to work for myself, and that’s why I chose to start this. Michelle: Well it’s been wonderful having you here each week. Thanks for the great chat Rani! 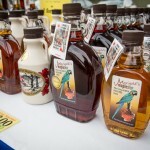 Allison from Marigolds Maple Syrup offers a variety of syrups, as well as candies and maple butter at the market. Michelle: Ok Allison, how did you get started with Marigolds Maple Syrup? Allison: Well I was at a farmers market where Brian Hamilton was, the farmer of the sugar bush, and I just started helping him out! He had to leave the table sometimes, so I started helping, and I was very interested in maple syrup, so I offered to start selling at other markets. Michelle: That’s great! Such a nice story about how people can get involved in this type of niche through farmers markets. Where is Brian based out of? Allison: He is based out of Simcoe, Ontario. His family has been making maple syrup for around 75 years, the bush is near Simcoe and Orillia. It’s way off the beaten track, to get into the farm you have to ski-doo in. Michelle: Oh wow! It’s really far out there. So we would love to know the difference between the kinds of maple syrup that you offer. I know there are darker varieties, but what specifically makes them unique from each other? Allison: There are three different colours of syrup- the light, the amber and the dark. The light syrup is harvested when the snow is still on the ground. When the ground thaws, the roots are picking up more moisture, and the syrup becomes more amber. Then there is the final harvest, which is the dark, when the roots are picking up a lot more sediment from the soil, which makes it very concentrated and dark in colour. This has to be filtered several times to remove the sediment. Michelle: Now would the flavour be more intense in the dark variety? Allison: More intense in flavour going from light to dark. The amber has a very strong maple flavour, and the dark is very maple intense. Michelle: Does that mean that it is sweeter as well or just fuller in flavour? Allison: Both, just an overall intensity as the syrup becomes darker. Michelle: Ok, great. Allison how do you like to eat maple syrup? Allison: On my oatmeal every morning, I also like to dip my chicken in it. I put it in my smoothies as well. Michelle: Yes, as a sweetener – I actually put it in my coffee for a healthy alternative to sugar! Allison: Yes, it gives a great kick to a coffee in the morning. Michelle: Well that’s great Allison, thank you so much for the chat!